Walter Benjamin (born 1892) lived through the First World War and its aftermath in Germany. Following the rise of Nazism he fled Germany in 1933 (to escape persecution as a Jew). He fled to France. After the occupation of France in 1940 he had to flee again. He made it to Marseille and managed to get on a freighter bound for India, but he was discovered and put ashore. Later he decided to walk across the Pyrenees to avoid border patrols. He had an American visa and hoped eventually to make it to the States to join his colleagues Theodor Adorno and Max Horkheimer. He managed to cross the border into Spain. While staying at a hotel in the Catalan town of Port Bou he was betrayed by the hotel owner. On 26 September 1940 he was found dead in his hotel room. The circumstances of his death remain mysterious. A few months before his death he wrote “Theses on the Philosophy of History”. 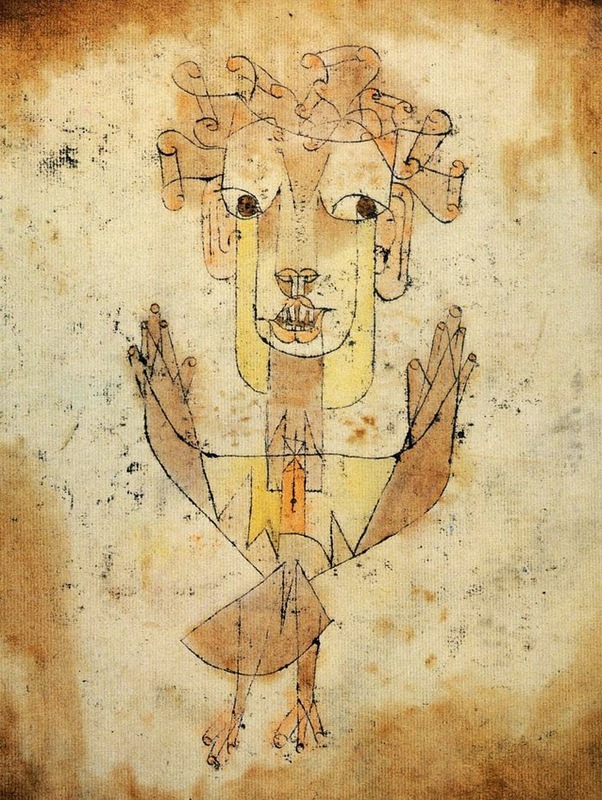 The ninth thesis is a meditation on a drawing by Paul Klee called “Angelus Novus” – a drawing which he had bought in 1921 and which remained one of his most prized possessions. Here is the drawing by Klee. Here is the ninth thesis by Benjamin. A Klee drawing named “Angelus Novus” shows an angel looking as though he is about to move away from something he is fixedly contemplating. His eyes are staring, his mouth is open, his wings are spread. This is how one pictures the angel of history. His face is turned toward the past. Where we perceive a chain of events, he sees one single catastrophe that keeps piling ruin upon ruin and hurls it in front of his feet. The angel would like to stay, awaken the dead, and make whole what has been smashed. But a storm is blowing from Paradise; it has got caught in his wings with such violence that the angel can no longer close them. The storm irresistibly propels him into the future to which his back is turned, while the pile of debris before him grows skyward. This storm is what we call progress. The intensity of Benjamin’s description here suggests that he experienced the condition from which the Angel of History cannot escape as a personal as well as a political impasse. Although he did not go to prison or suffer any other severe repression on account of his beliefs or activities, his outlook on life is inseparable from his perception of history. Like so many of his generation, Benjamin experienced the First World War – the bloodiest conflagration in human history up to that time – as pointless and horrible carnage. But the revolutionary upheaval that occurred in its wake, in Germany, Russia, and elsewhere in Eastern Europe, seemed to represent a turning toward social emancipation as powerful and promising as any that had ever been experienced in the past. That promise was not realised. The revolutionary movement faded, to be replaced first by a cynical nihilism then by fascism. Like Klee’s Angel, Benjamin felt caught in history’s tangle – propelled forward, yet incapable of disengaging from the past. 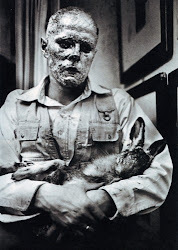 He was acutely sensitive to everything going on around him, seeming to live without the normal defensive mechanisms that block out the horrors being perpetrated around us. In the historical project of liberation, Benjamin represents the Angel of History as being on our side – the angel wants to intervene but does not have the power to do so. Do we? Benjamin criticizes the pessimism that regards fundamental change as impossible and that tells us that historically, utopian dreams have been losing propositions. As an antidote to resignation, Benjamin proposes “the gift of fanning the spark of hope [that was] in the past,” as if memory could ignite a kind of blaze of aspiration across the generations. Yet Benjamin could not figure out how to join with others to put such a memory-based politics into practice. Although he enjoyed the company of his friends, he conducted his life quite privately, independent of any political association. Alone, feeling too deeply the catastrophe of history, he was himself destroyed. A suggestion: The angel depicted by Paul Klee has died. It signified the hope of a utopian impulse. Benjamin's Theses on History are a dialogue with historical materialism, which for all its faults, retained the utopian impulse, and insisted that there could be a decisive break with the bad history of the past, and there would be some kind of redemption - it wouldn't all have been for nothing. Is there any discourse like that now? Are we working together – struggling – fighting perhaps – for a better world? In a sense history has died. Here in Europe at the moment the only talk in the corridors of power is about balancing the books. I don't hear any visions of a better society that might become possible once the books have been balanced. If I raised the question to an imaginary European bureaucrat once the debts have been paid (assuming they can be paid), I imagine being told: "You can shop. What more do you want?" And he leaves before I have time to speak because he is convinced that the question is unanswerable. We no longer live in an age in which history's "winged messengers" bear witness to the suffering endured by millions and the conditions that allow such suffering to continue. Thinking about past and future has collapsed into a presentism in which the utter normalization of a punishing inequality and the atomizing pleasures of instant gratification come together to erase both any notion of historical consciousness and any vestige of social and moral responsibility owed as much to future generations as to the dead.